I had sent the money up for my daughter and her husband to buy a camper that was for sale, so that it would be there when we arrived. After traveling more than 8 hours with our five cats and dog, we came across the bridge and up the hill to view our purchase. I was very tired after loading the trailer and the long drive, opened the camper door, stepped inside, then right back out and around to the back side of the truck where Megan wouldn’t see me and let the tears come. The enormity of our situation hit me like a ton of bricks. How in the world could the two of us actually LIVE in that tiny space with our cats? From our farm, to 3 locations in North Carolina and the few days with the census, to this. There were no choices, it was all we now had. I needn’t have worried about so little space. I turned on the water and we found burst pipes, so out to Lowe’s to buy all the things needed and that problem was repaired. We were up the road at my oldest daughter’s home for supper and showers, then walked down after dark to lay down with the cats and our dog as they got used to their new surroundings. It poured that night and Megan woke up at dawn in a puddle of water. Later that day we coated the roof of the camper. That evening my daughter’s husband told us there had been questions about the camper appearing and days later, our arrival. Covenants on this “island” restrict any mobile homes on lots. So the trailer became home for the cats, a place for our clothes, and we took up nightly residence on their living room couch and floor. A storm on the fourth night we were there blew up the air conditioning unit on top of the camper. We bought a window model to keep the temp inside under 78 in the hot afternoon sun. A man from the city with a vacation home in here knew of our situation, and offered us the use of one of the bedrooms with two twins beds on the nights they or their friends were not using it. So on average 3 nights a week, we would drive down at 11 pm, get our blankets and pajamas from the back of the truck and get to sleep on beds. Up at 7 am, get dressed and carry things back out to the truck. He said he never even knew when we had been there. Gratitude to this kind man and his family. Clothes, bottles of water, toiletries, blankets and pillows, in and out of the truck, in and out of different homes, eating lunch in the park or down near the camper, suppers with my oldest daughter; this was now our life. No rooms, no home, nowhere to rest or take a nap. Through depression, despair, shame, and fear shown a small glimmer of hope. I would find a way to change this. 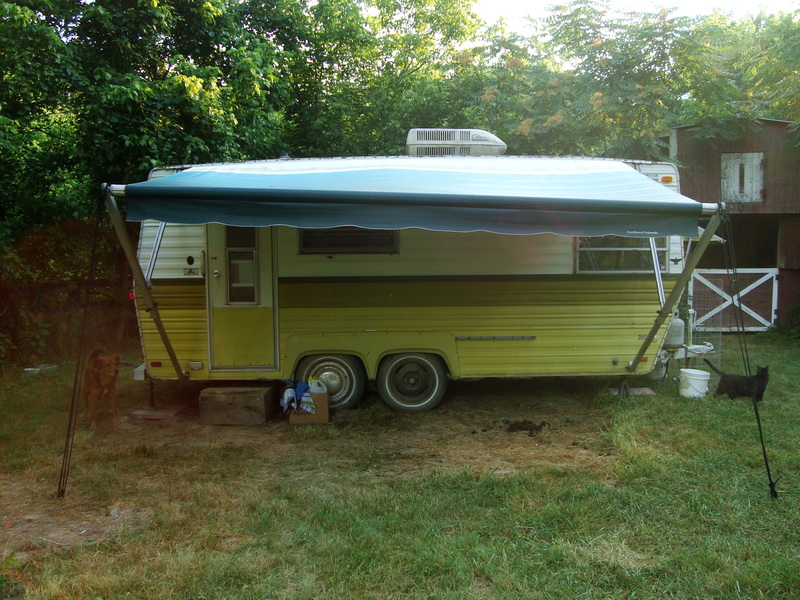 The camper, set up and waiting for our arrival in July of 2010. 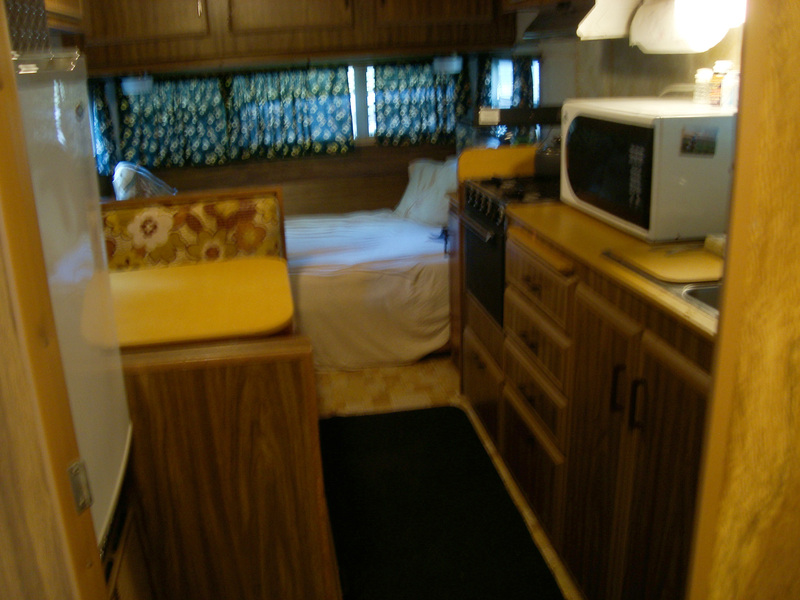 Inside the tiny camper, I took this photo as I stood in the bath. A camper should never have to be somebody’s home, and now there is not even that….. I pray you situation will change for the better – soon!